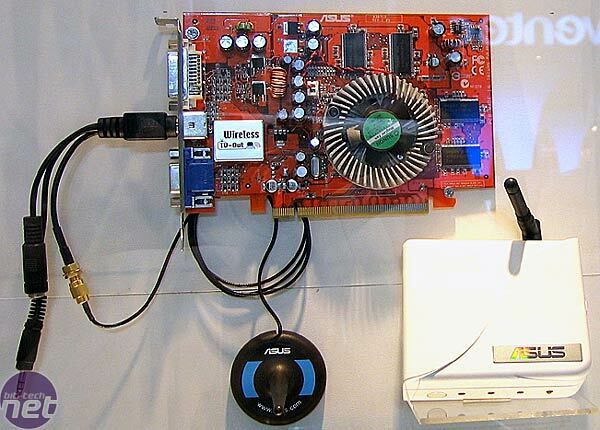 We have just seen an interesting product on ASUS’ stand: a video card that features a wireless TV-Out solution. It allows much more flexibility for where your Media Center PC can be located in the living room, as there is no physical connection between the video card and the TV. The wireless statement is not strictly 100% the case as there still needs to be a wire connected to the TV-Out port, which has the wireless transmitter attached to it. However, the radio transmitter requires a line of sight with the receiver for it to function flawlessly. ASUS quote a range of up to 100m in an open space with a line of sight, over four channels at 2.4GHz. While you may not have a line of sight in your living room, you will only need a range of 5-10 metres, which this card should be more than capable of. The WiFi TV-Out feature will eventually appear across the whole of ASUS’ video card range, but for the moment it is only on the mid-to-low end graphics solutions – those that you are likely to want to use in a Home Theatre PC, due to their low noise and heat characteristics.